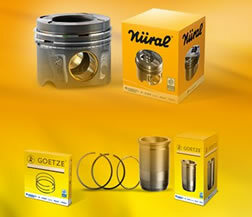 Our main stock holding of Pistons is from the Nural / AE range. 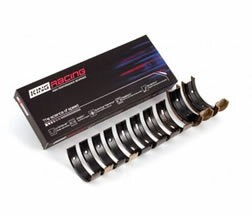 We do have other brands in stock and do have Mahle & KS available next day. 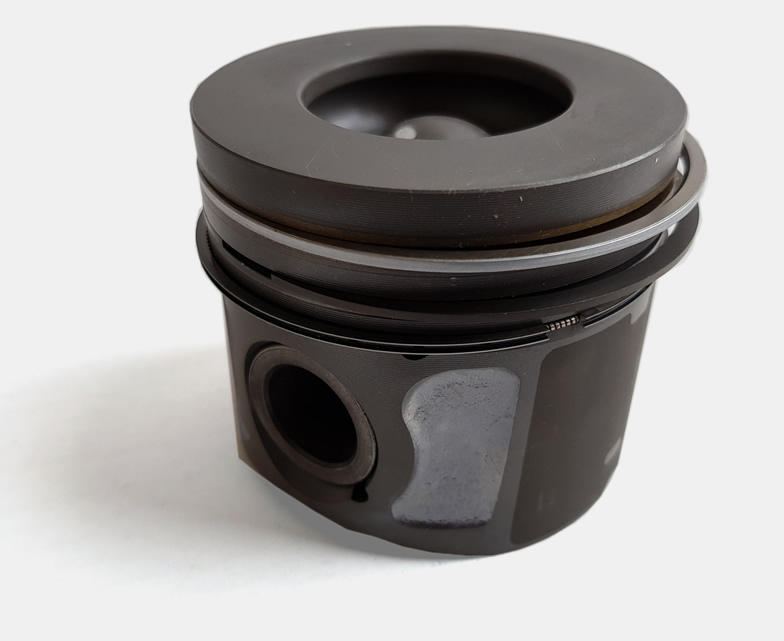 We also have access to forged pistons for performance applications. How do Pistons work in a engine? Pistons are located in the engine block and move up and down the cylinder. The distance travelled is set by the crankshaft & conrod length, this measurement is known as the 'Stroke'. The piston and its rings perform a gas-tight seal. When the piston moves upwards, the air & fuel mixture inside the combustion area is compressed. When the piston meets the top of its stroke the fuel mixture combusts, in a petrol engine, the air / fuel mixture must be ignited by the spark plug. The explosive force of the combustion forces the piston downwards which in turn rotates the crankshaft resulting in power output. Piston rings are located on the side of the piston and run around the circumference of the piston forming a gas-tight seal. When piston rings are worn compression can be lost and you may notice blue smoke from the exhaust. 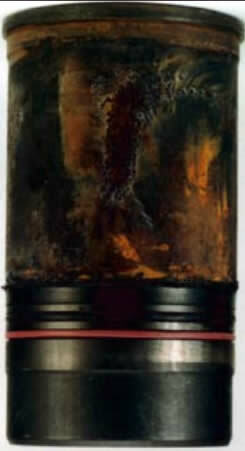 The blue smoke indicates that oil is being burnt in the combustion area. 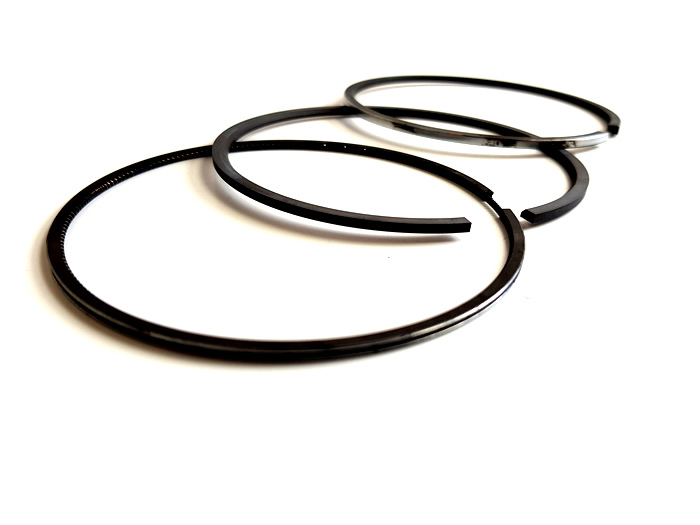 This is a common sign of either worn valve stem seals or piston rings. We stock Goetze, Schottle, Hastings, Tarabusi & NE Europe rings. On conventional modern car & light commercial engines it is likely to have three rings per piston. The top 2 are the compression rings and the bottom is the oil control ring. Certain engines have more or less rings depending on the piston design. Great care should be taken when assembling new piston rings that any tapers, keystones & cutaways match that of the piston ring lands. 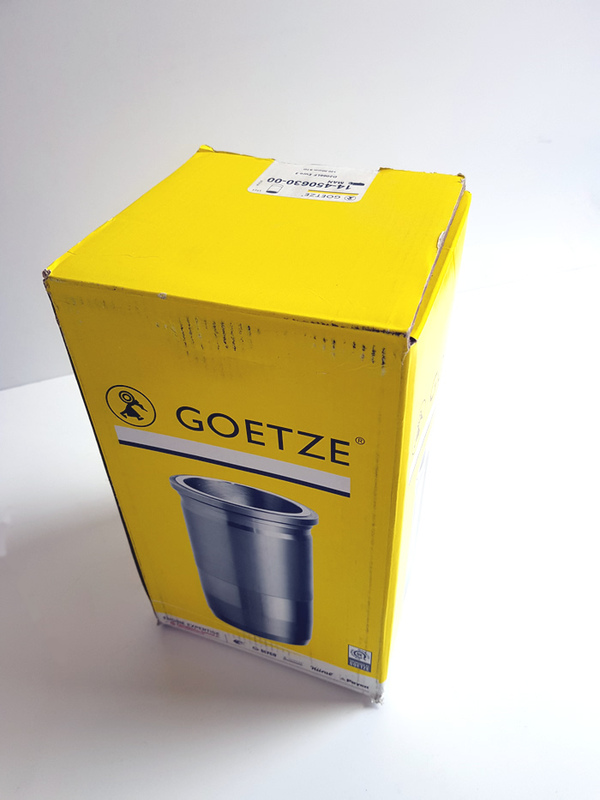 We stock Goetze & Tarabusi Liners. Not all engines have a typical wet liner and do not have to be replaced. The engine reconditioner will know this and can often bore your block to an oversize. Always check that we have stock of the oversize pistons before having the block bored. Some engines like the Rover K-Series have a wet liner that is removed from the block and replaced with the piston. 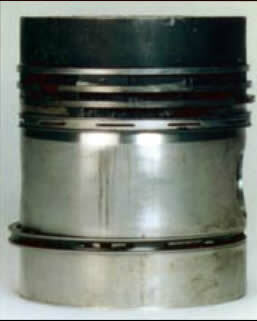 In some cases, the block may be to badly damaged to be bored or oversized pistons may not be available. In this case, the engine reconditioner could sleeve the original block with a dry liner to bring it back to a specific size. Symptom: Loss of power. Engine noise. Fumes from the engine breather. Cause: Exceptionally high combustion temperature. 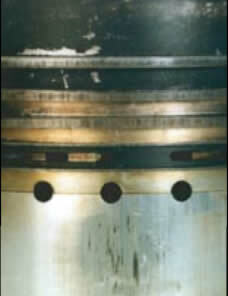 Malfunction of piston oil cooling jets (in engine incorporating this equipment.) These cause seizure close to the piston crown, which may result in piston ring damage and progression of seizure down the piston skirt. Symptom: Combustion gases ventilating to coolant, Engine noise, Eventual destruction of liner. • Cylinder block distortion • Incorrect tightening of cylinder head studs. • Misaligned block counter bore. • Foreign material assembled under flange. • Incorrect location of cylinder head gaskets. • Incorrect liner assembly procedures. 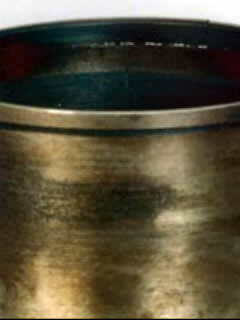 Cause: High frequency vibration resulting in cavitation erosion. This may be promoted by general engine wear or repetitive use for long periods at higher than normal engine loads. 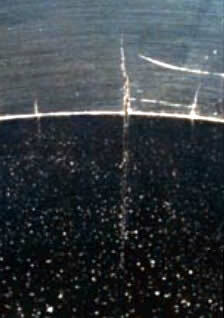 Remedy: Clean and check sealing ring grooves and contact areas. Replace cylinder liner. Ensure that the coolant system is operating at the correct pressure. Use coolant inhibitors as recommended by the engine manufacturer. Symptom: Engine noise. Oil consumption. Cause: Incorrect assembly of circlip. Fitting of used circlips. End pressure transmitted via the piston pin, possibly associated with connecting rod misalignment, tapered crank journals, or excessive crankshaft end float. 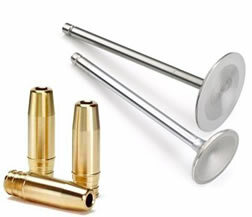 Foreign material assembled in piston pin bore. Remedy: Correct any cylinder bore damage. Check for and correct any connecting rod or small end bush misalignment. Check for and correct any crankshaft end float. 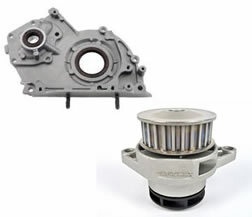 Replace piston assembly, ensuring that the circlips are correctly located. Symptom: Loss of power. Engine noise. Fumes from engine breather. Cause: a. Damage concentrated on one face: Lack of lubrication. b. 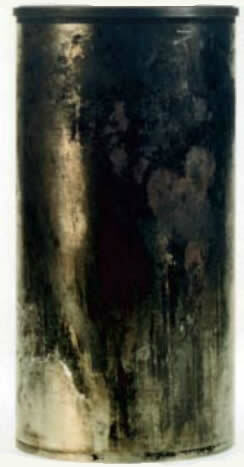 Damage on both faces: Progression of damage caused by lack of lubrication. Insufficient piston to cylinder clearance. Cylinder bore distortion. General engine overheating. Restricted coolant circulation. Remedy: Inspect cylinder bores and coolant circulation. Correct as necessary. 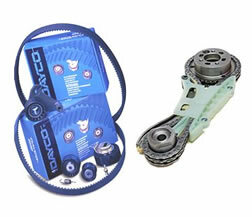 Replace damaged cylinder components. Cylinder Liner Bore Distortion. Scuffing or Seizure of piston & rings. 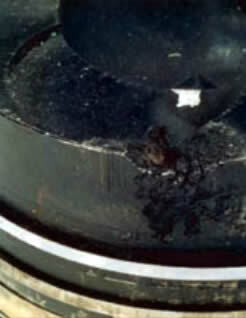 Carbon deposits on the outside of the liner. Symptom: Loss of power. Oil consumption. Fumes from engine breather. Piston seizure in extreme cases. Cause: Cylinder block distortion. Cylinder head distortion. 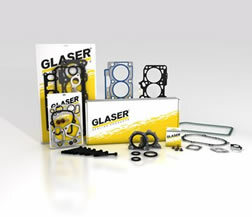 Damaged or incorrectly fitted cylinder head gasket. Incorrect liner fitting. Remedy: Thoroughly clean the engine block bores. Check for block bore distortion and rectify if possible. Symptom: Cannot be detected during normal engine operation. 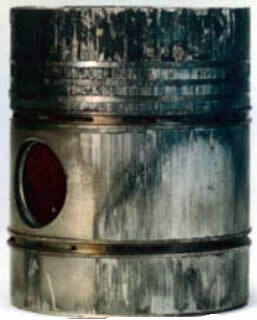 Cause: Extremes of temperature applied to piston crown, resulting in thermal shock. May be promoted by exceptionally high engine load when operating in low ambient temperature. Symptom: Oil consumption, with possible fumes from engine breather. Cause: Excessive cylinder surface temperature. 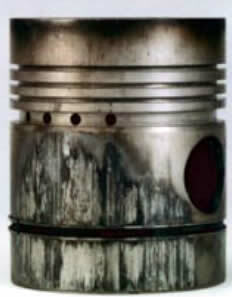 Marginal lubrication, particularly during early engine life. Cylinder bore distortion. Remedy: Rectify any cylinder bore damage. Replace piston rings, also the piston, if necessary. Ensure the complete engine lubrication system is fully primed (oil pump, filter, etc.) Observe running in procedures as recommended by the engine manufacturer. Symptom: Loss of power. Oil consumption. Emission of fumes from engine breather. 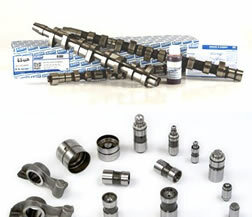 Cause: Exceptionally high combustion pressures, as may be caused by advanced injection pump timing, overuse of aerosol starting aid, increased compression ratio. Remedy: Establish cause and take remedial action. 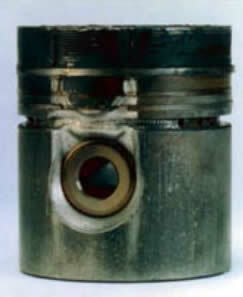 Replace piston assembly. Symptom: Loss of power, emission of fumes from engine breather. Exhaust smoke. Cause: Incorrect fuel injection, injection timing, over fuelling, damaged or incorrectly located injector. Remedy: Inspect and correct fuel injection equipment and timing. Check and correct any damage to cylinder bore. Replace piston.